(Free) Weekend Project: Bow ties are Cool. 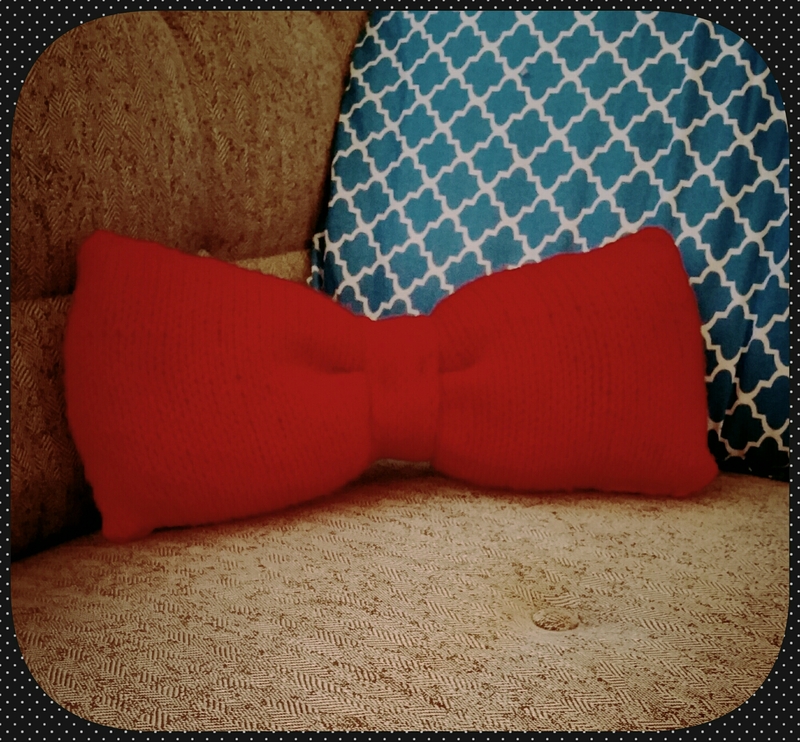 Here’s my weekend project: a cute bow tie pillow! It’s fairly simple to make, too- just a little time consuming. Gauge: 11 st. by 16 st. = 3×3 inch block. Gauge isn’t important for this pattern unless you knit really tightly. Here’s the best part… just knit until your piece measures 6″. The ends of the piece will curl up because you’re just knitting, but not to worry. Bind off. Then flip the piece inside out and sew up one side, being careful to not let the edges go all crinkly on you. Then sew the other side almost all the way up, flip back right side out, and stuff the pillow. After you’ve stuffed it, sew it the rest of the way up. Repeat until the cinch measures 6″. Bind off, leaving a long tail. Take some extra string, and use it to “pre-cinch” the middle of the body of the bow. 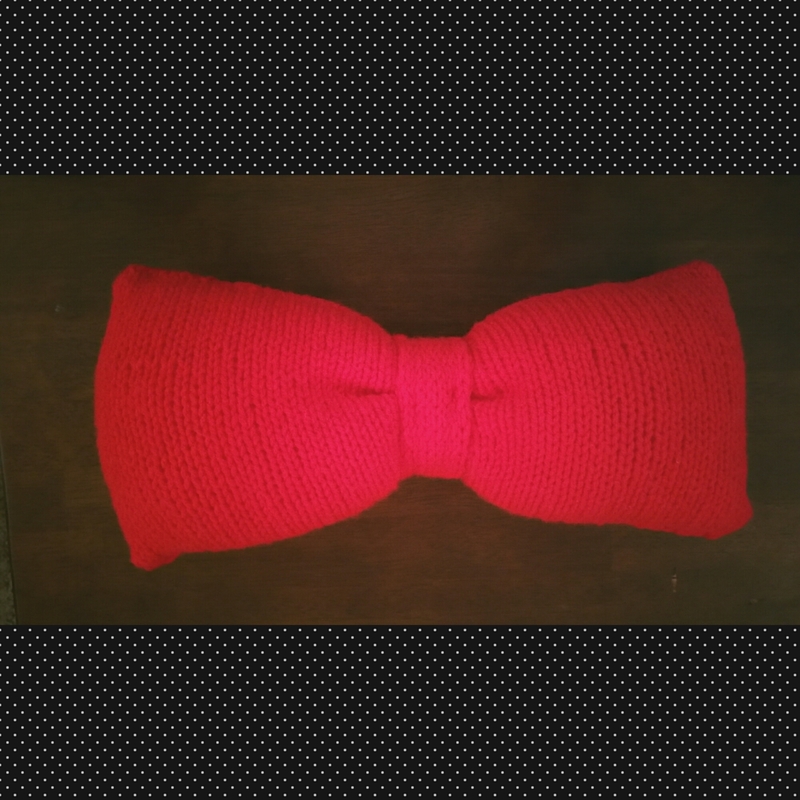 Then take the knitted cinch you made, and wrap it around the middle section of the bow that you just “pre-cinched”. Then, using the long tail you left on the cinch, sew the cinch together. I also sewed the cinch to the body of my pillow, so it wouldn’t slip off. Leave me a comment or send me a picture of your project- I’d love to hear from you! Super cool! Thanks for the pattern!